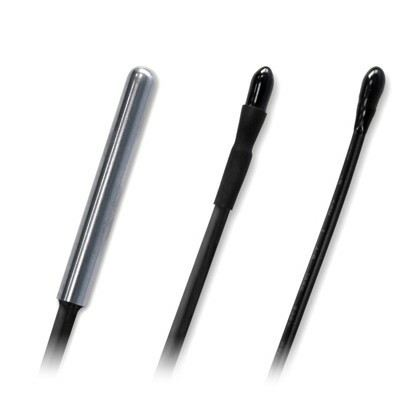 Temperature probes available in steel and epoxy. The Epoxi probe (ZN1AC-NTC68E) is useful at normal conditions of working and installation. A cable of 1.5m cable is included in the product packaging. The Epoxi probe stiff cable (ZN1AC-NTC68F) is useful for more complex installations, like canalizations (for example, for radiant floor protection), making easier its installation without any kind of guide cable. A cable of 2.3m is included in the product packaging. The Stainless Steel probe (ZN1AC-NTC68S) is ideal to measure fluids within ducts or pipes, allowing to measure temperature ranges up to 125 degrees (like an application of regulation or control of solar thermal energy). A cable of 1.5m cable is included in the product packaging.